A blustery September day found Tavy Tars (lite on this occasion!) 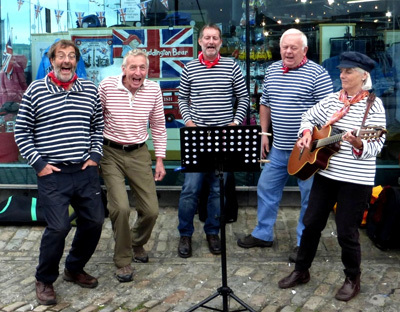 singing on Plymouth Barbican adjacent to Cap'n Jasper's. The occasion was Plymouth Seafood Festival on 24 September - so not only a special historic venue, but delicious aromas included. Scary looking bunch aren't they? However they didn't manage to scare away all the resilient Plymouth crowds. Just a good job it was only Tars lite.